The quality of Finnish film music during the 1940s through the 1960s is enviably high (...). Tommi Hakala and Johanna Rusanen-Kartano grab the essence of these songs. The Tampere Philharmonic performs with rigour and swing. 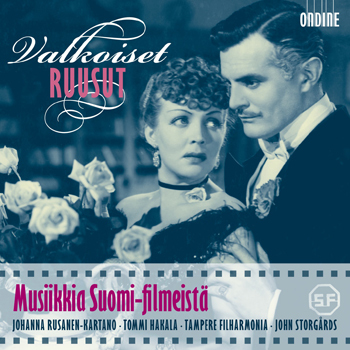 This CD features compositions written for several Finnish motion pictures, such as the classics Valkoiset ruusut, Pojat ja Kaivopuiston kaunis Regina, Akselin ja Elinan häävalssi, Sulle salaisuuden kertoa mä voisin, Romanssi and Sinun silmiesi tähden. Suomi-Filmi is an important Finnish film production and distribution company established in 1919 by noted film director Erkki Karu. The Tampere Philharmonic Orchestra is led by its chief conductor John Storgårds. The included songs feature soprano Johanna Rusanen-Kartano (4, 5 13, 22) and baritone Tommi Hakala (4, 11, 12, 22, 23).